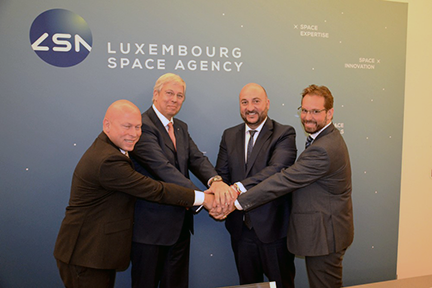 A major step forward has been taken — the Luxembourg Space Agency (LSA) has been launched, under the umbrella of the Luxembourg Ministry of the Economy. Unlike many similar organizations abroad, the LSA will not conduct direct research or launch missions, but will foster collaboration between the major players in the space industry, with a mission to accelerate the emerging innovation-oriented businesses. At the same time, an investment fund dedicated to space projects is being set up in the form of a public-private partnership. Targeting an initial capital of 100 million euros, of which 40 million is provided by the State — the objective of this fund is to provide equity financing to new space companies with innovative ideas and technologies. The management of the Luxembourg Space Agency has been entrusted to Marc Serres, who until then was Head of Space Affairs at the Ministry of the Economy and who is also Vice President of the European Space Agency’s Council since last spring. Luxinnovation, as a national agency working for the economic development of the country, is one of the key partners of the LSA, through its expertise in supporting innovative companies and start-ups. The other partners are the Employment Development Agency (ADEM), the Chamber of Commerce, the National Research Fund (FNR), the Luxembourg Group of Aeronautics and Space (GLAE), the Intellectual Property Institute of Luxembourg (IPIL), Luxembourg Science Center (LSC), Luxembourg Space Tech Angels (LSTA), SES, the National Credit and Investment Company (SNCI), Technoport and the University of Luxembourg. In Luxembourg, in the wake of satellite operator SES, the largest commercial satellite operator in the world, commercial space activity now accounts for nearly 2 percent of GDP, one of the highest level in Europe. Minister of the Economy Étienne Schneider said that the announcement of the creation of this agency and the dedicated fund completes, in a way, the process of setting up the Spaceresources initiative. [Luxembourg] is now ready to welcome and support the development of space industry players who can progress together. In addition, as part of the mission to promote the international Luxembourg economy to attract the most appropriate international companies, investors and talents, the agency will strive to target the international space sector and raise awareness opportunities offered by Luxembourg. This will be done with input from the agency's market intelligence team who can provide all the data and analysis that the space agency may need. Sasha Baillie, CEO of Luxinnovation, added that, more specifically, the organization will ensure that start-up support programs are attractive to start-ups in the space sector and that the advice provided to all companies on the various national and European funding instruments for their R&D projects meet the needs of space companies. On the occasion of the presentation of the LSA, the rector of the University of Luxembourg, Stéphane Pallage, announced the establishment of a future interdisciplinary Master dedicated to Space — "A diploma that does not exist anywhere else,” said the rector.